Martin Solveig, Fedde Le Grand, Nora En Pure and actor-turned-DJ Idris Elba are among the latest names to be added to South West Four's 2018 line-up. The London festival returns to Clapham Common for its 15th outing on Saturday August 25th and Sunday 26th. 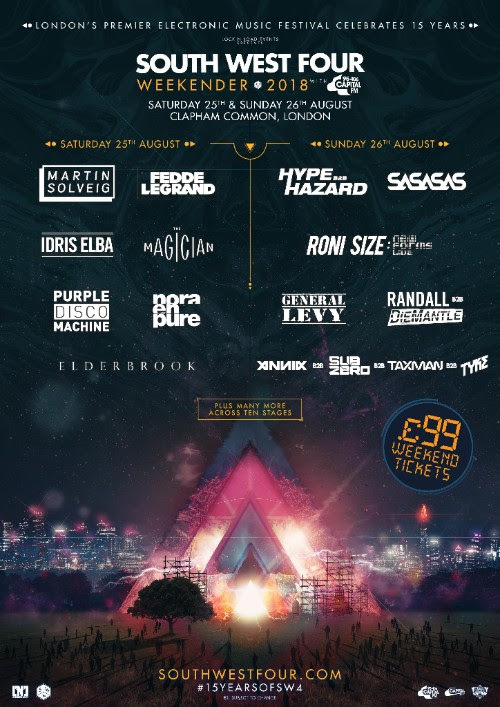 Other added acts include drum & bass duo Hype & Hazard, General Levy, Purple Disco Machine, The Magician, CamelPhat’s ‘Cola’ vocalist Elderbrook and another London d&b stalwart SASASAS. Armin van Buuren will headline the indoor mainstage on the Saturday night while DJ EZ headlines on Sunday. Marshmello and Chase & Status will also play headline slots. Other recent additions include Galantis, Basement Jaxx (DJ) and Eli & Fur plus Armand Van Helden, Dillon Francis and Hannah Wants. The festival is spread across ten stages on a site in Clapham Common and is set to be something really rather special with more names still to be added to the already stacked line-up. Tickets are running low so grab yours here. Take a look at the full list of additions to the bill below and check out last year’s aftermovie to get yourself excited.